Do you see the ties on the picture? This is what second-hand looks like. 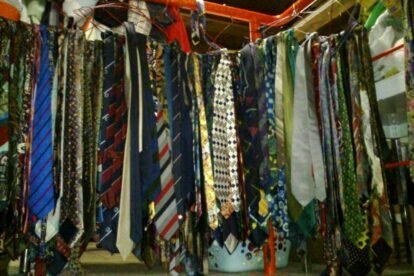 You can imagine any type of clothing — ties, shirts, trousers, T-shirts, dresses — and in Ruzynsky second-hand store you will always find many of those, so you will be amazed. This second-hand store offers the vintage clothes you can also find in the center of Prague, but for a lower price. The lower price is balanced by the effort you have to invest in searching. As I mentioned already, there are many pieces of each type of clothing, and not all of them are so tempting. But I have found a wonderful shirt from the ’50s, a dress from the ’70s and let’s not speak about the ’80s and ’90s, because I found a jacket even Vanilla Ice would be jealous of. Ruzyňský is located outside the center and I suggest you save some time to visit it. The connection can be found on this website – the final station is ‘Stare Namesti’. While walking to the shop you will pass a prison (who passes prison on a tourist visit??). The price is per piece or per kilogram, and I suggest you negotiate when the piece is not in the best condition. This spot is really for second-hand lovers. I like to relax here – I am being honest, because I had two beers in Kulovy Blesk (check the Kulovy Blesk article) and I wish I had time to visit the shop right away.